I've watched fine weekdays come and go over recent weeks and I've been walking on most Saturdays, but last Saturday was a dismal day and next Saturday is not looking too bright. 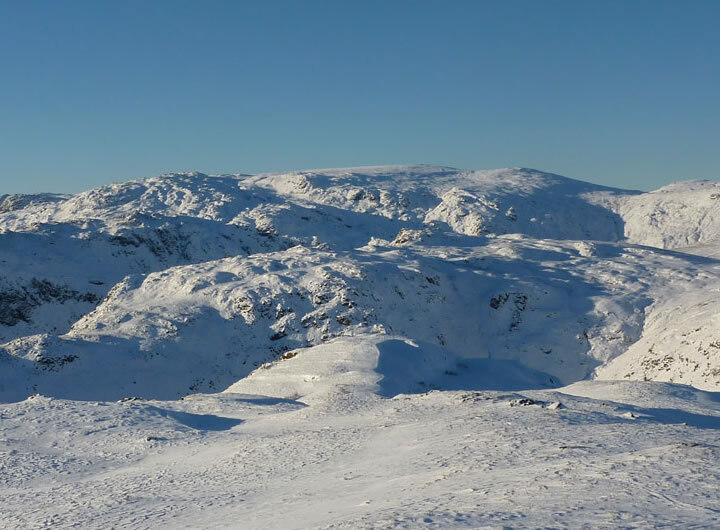 I decided it was time to have a day off and take advantage of a forecasted excellent day on the fells. Would the weather hold, will I get there and back safely? Well, let's just say I must have survived otherwise this page wouldn't be here! The day started slowly, the hand-brake was frozen on. I ran the car down to Tesco at 6am - they have an undercover car park and whether this helped or not, it was sorted. The windscreen wash was also frozen and the car heater isn't too good either, but nevermind. 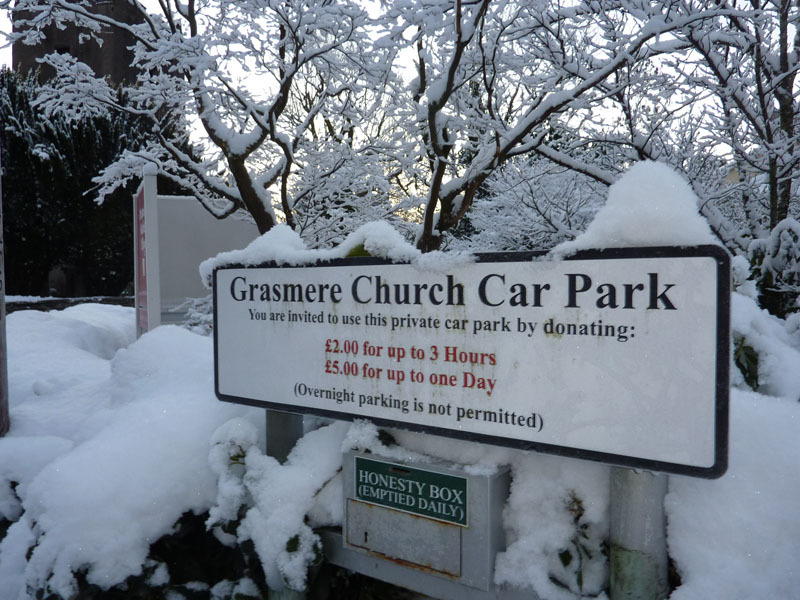 I'm sure this price has shot up, but it's still good value for a day's parking in the Lakes. Overnight Parking? No danger of that. 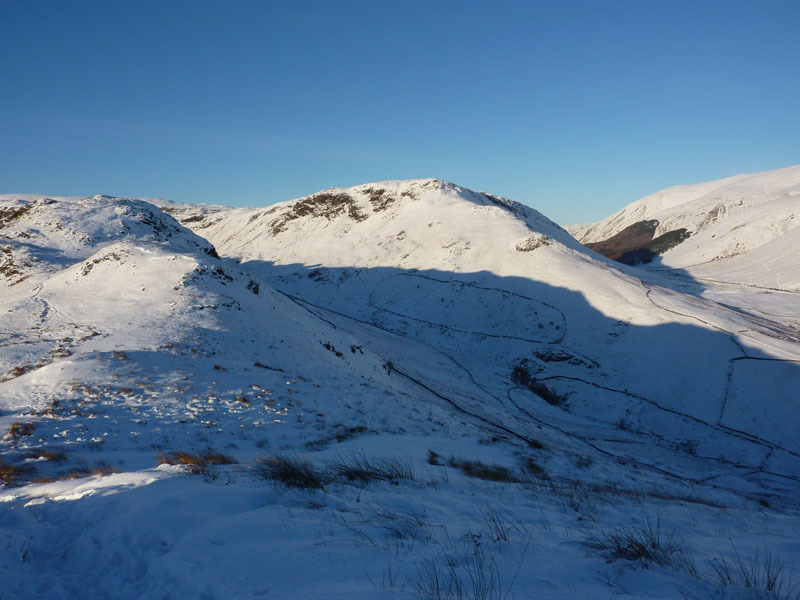 I headed up Easedale Road and then along the road to Helmside for my ascent of Steel Fell. 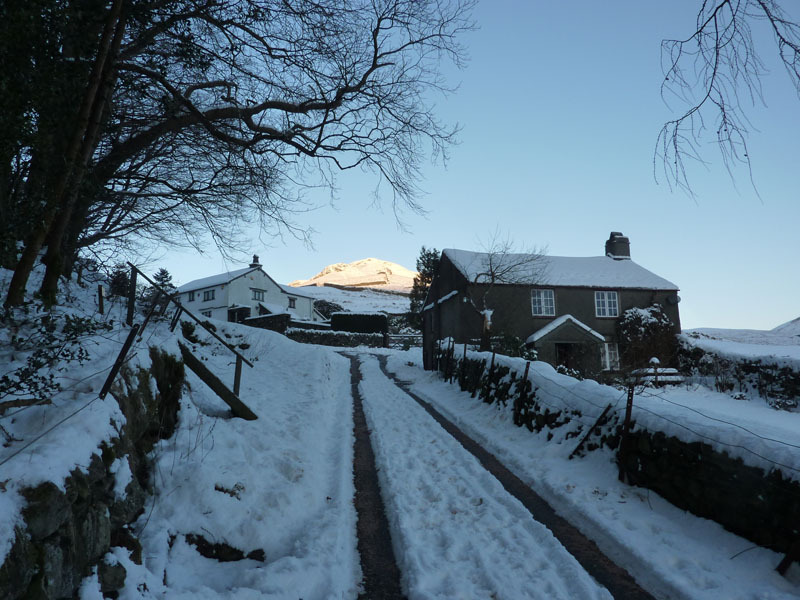 This was Plan B, I had wanted to get to Buttermere for High Stile, but the roads might have been a bit tricky, so this became the walk. Steel Fell is one I climbed many, many years ago and I wanted to take another look - with my camera. 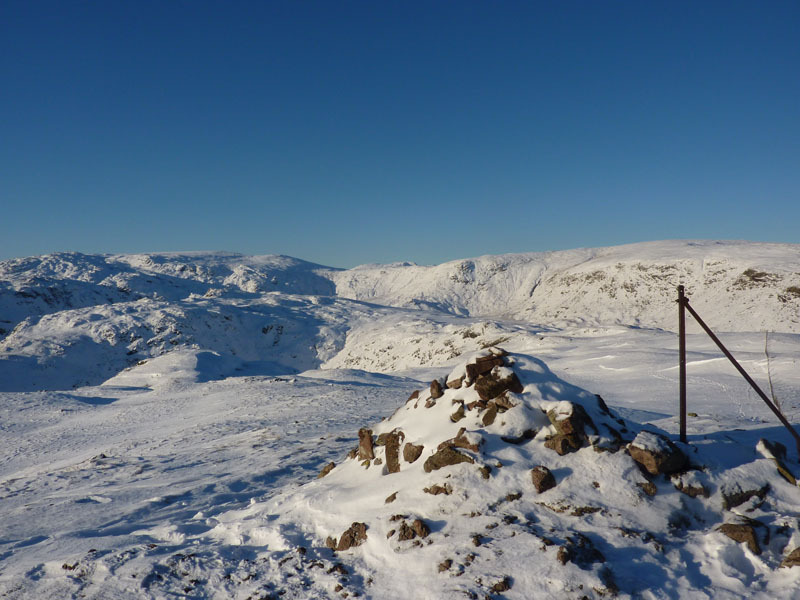 One lifetime ambition I have is to climb as many "Wainwrights" as possible by a route detailed by him. 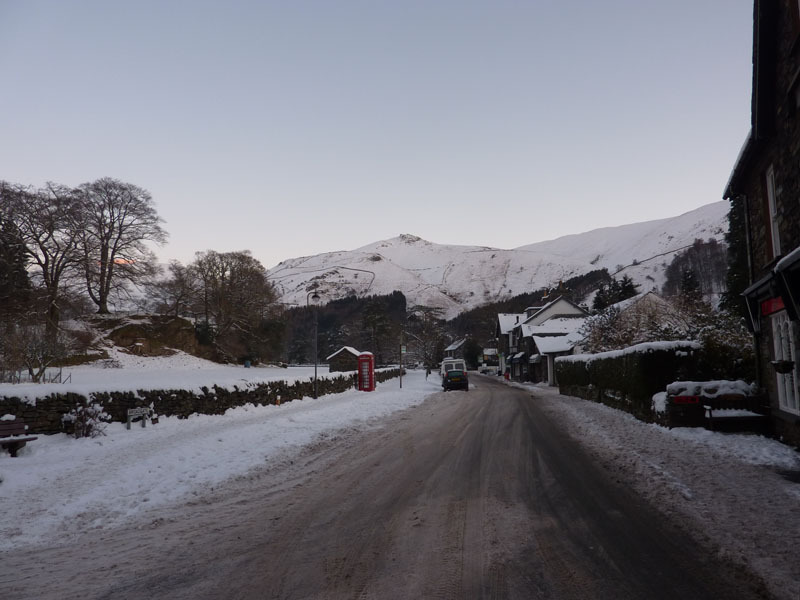 This is one such climb, he says start at Grasmere Church, so I did. 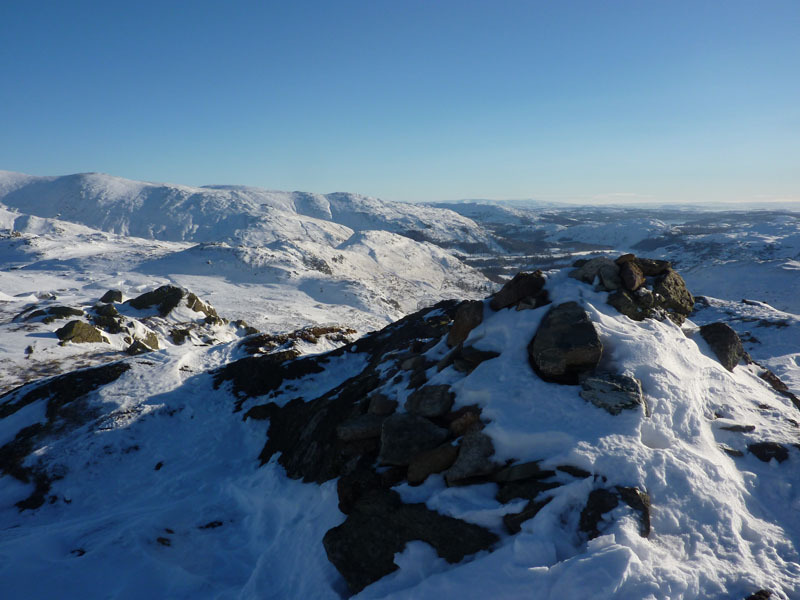 I was carrying crampons and optimistic that I would not need them. The snow is quite deep, but a trail has been blazed and I'm using the other chap's footprints - same size, same stride - very handy. Hope he's going the same way. More than once I thought I'd made it, only to become disappointed. 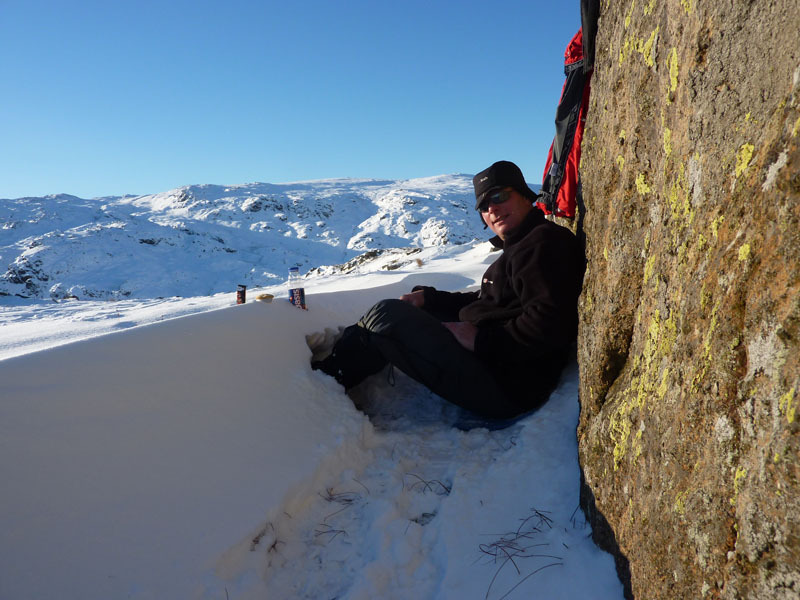 The snow was getting deeper and t'other chap's prints were lost in the blown snow for some of the time. I left a note for anyone following, it's not a race. Wainwright champions the view from Great Calva, this is the reverse. I recall a damp day last time I was up here, mid-90's. This is more like it. 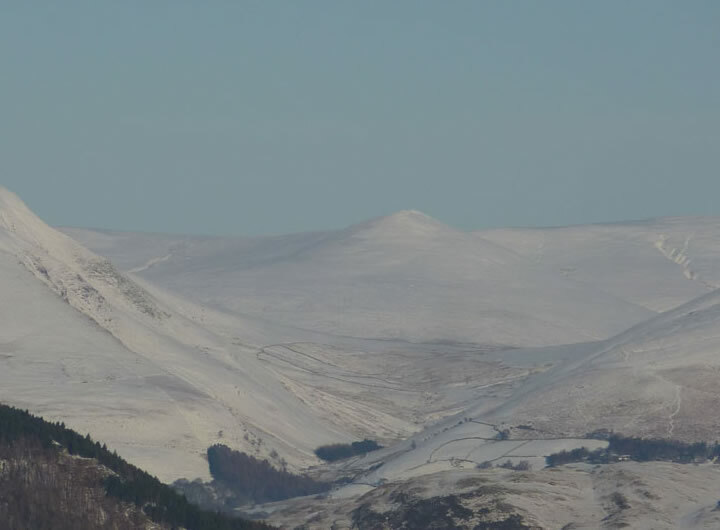 Not easy to make out, white-on-white, it's in the middle distance with high point, High Raise in the background. 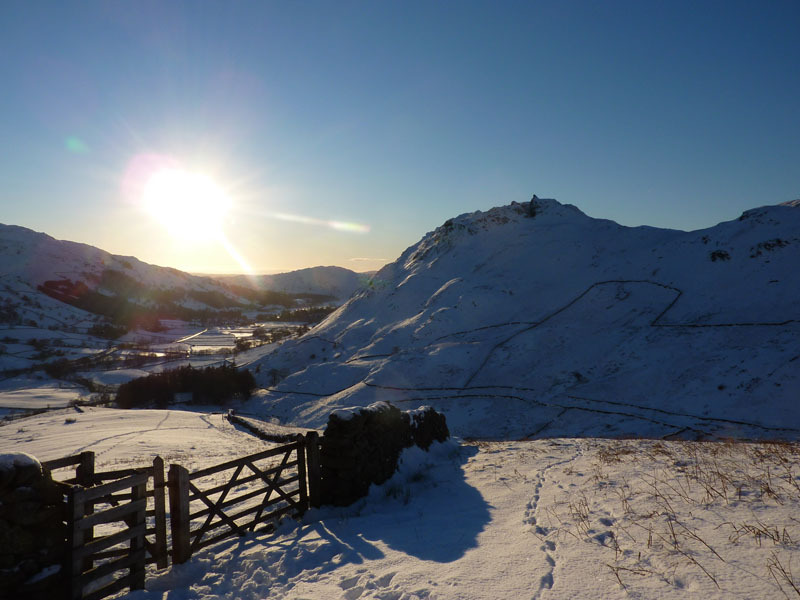 I'm off to Calf Crag - "an easy walk, with fence as guide, but very marshy in places". 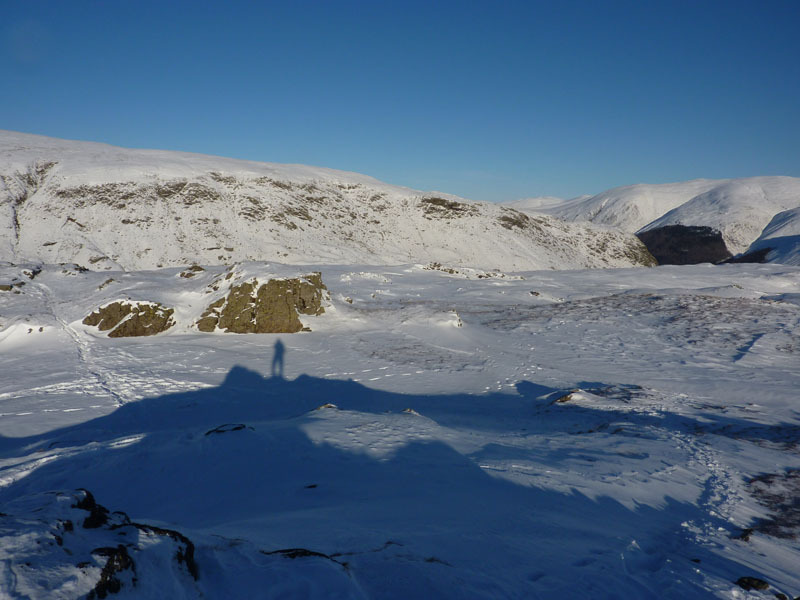 Not today - a difficult walk with deep snow, no marshy bits. 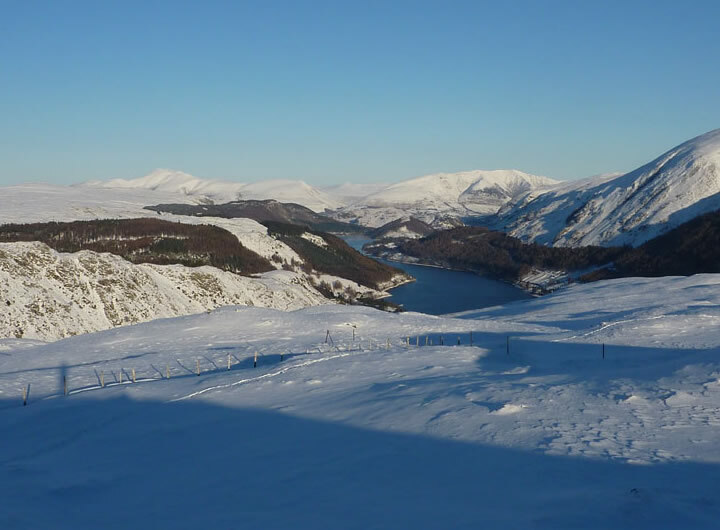 This was both delightful and really tough going, snow up to knee depth. Probably not in anyone's top 10, but not in the bottom 10 either and I'm going to show you THE best place to have lunch on a day like this! South-facing, out of the breeze. Coat hangers, drink holder, feet warmer, mince pie and Mars Bar rests. A plug point and you'd be able to bring your laptop. 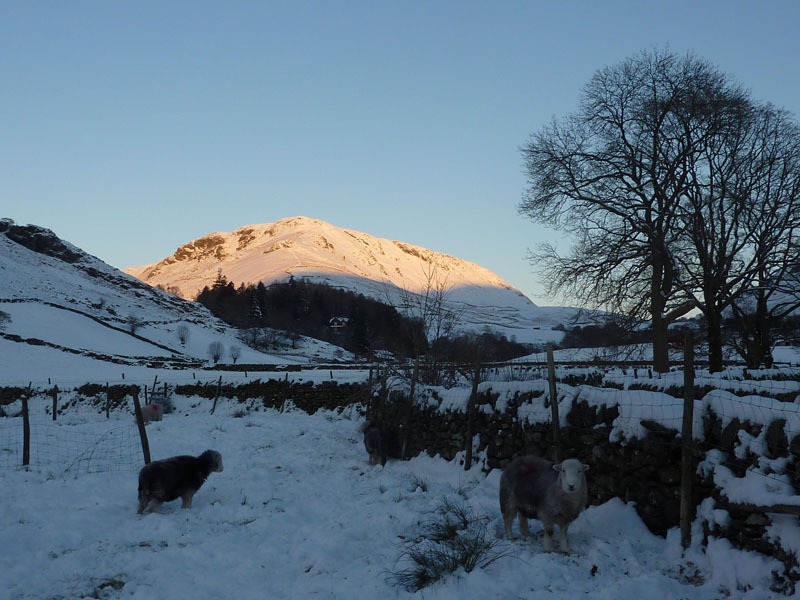 Well I think it's Blea Rigg. 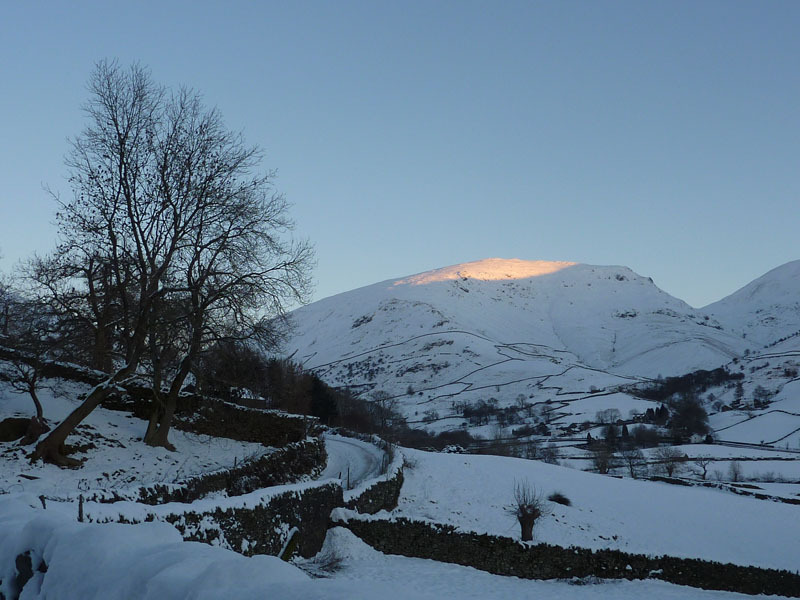 I'm on the ridge route to Gibson Knott. 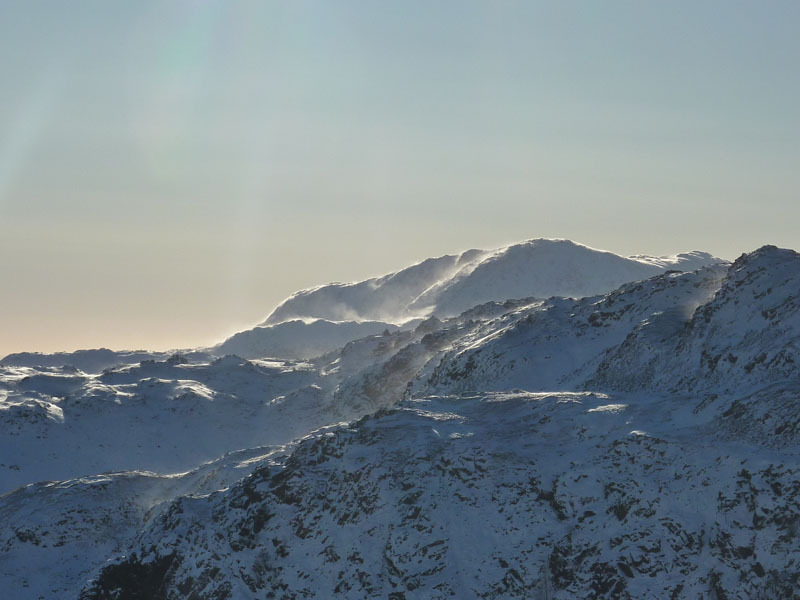 The Langdale Pikes as you don't usually see them - not the near bits, the ones on the horizon. Gibson Knott and the First Hello's! 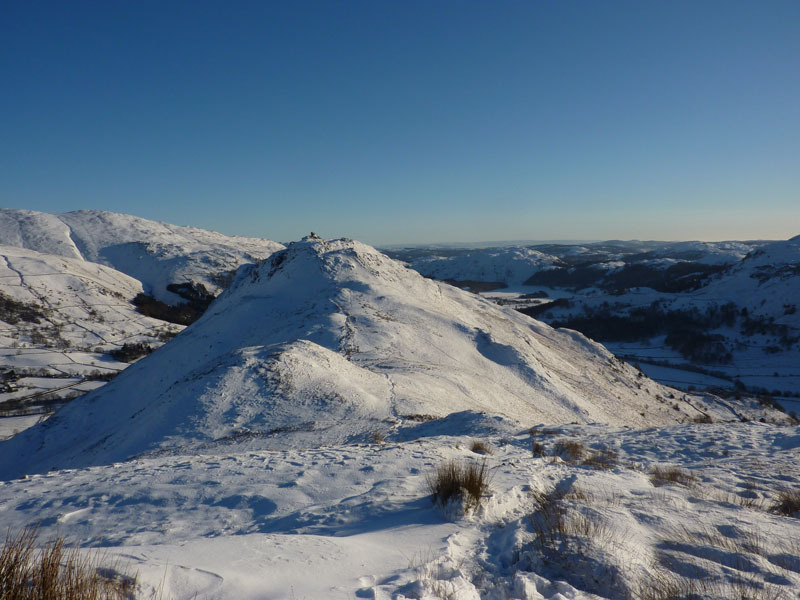 Probably the summit, there are a couple of bits that look the highest - visit them all and you can't go wrong. 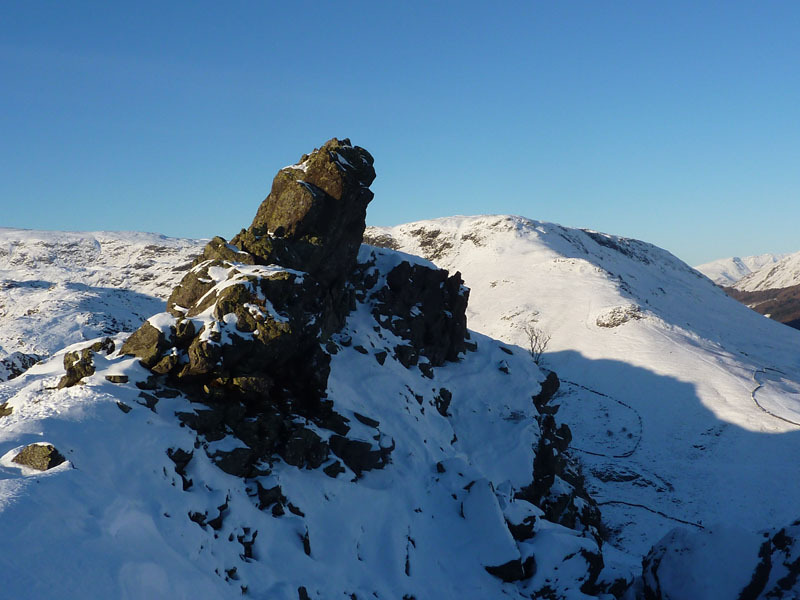 My first thought this morning was to leave Calf Crag and head for Sergeant Man, but I thought better of it - this is a little more straightforward and makes "A Greenburn Round". I've often wondered about the walled enclosure in Greenburn - it shows up well in the snow. Also known as "The Howitzer", sometimes climbed, sometimes not - not for me today. 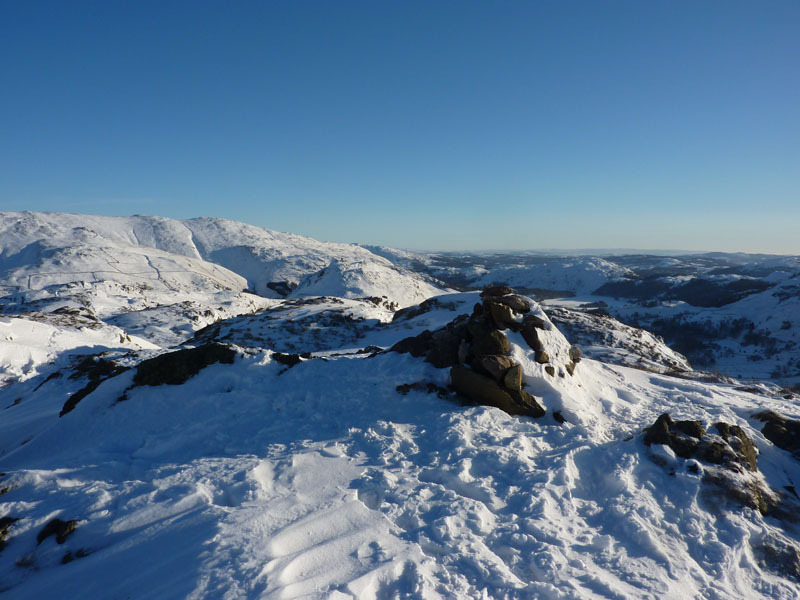 Another great feature of Helm Crag, time to descend back to Grasmere. 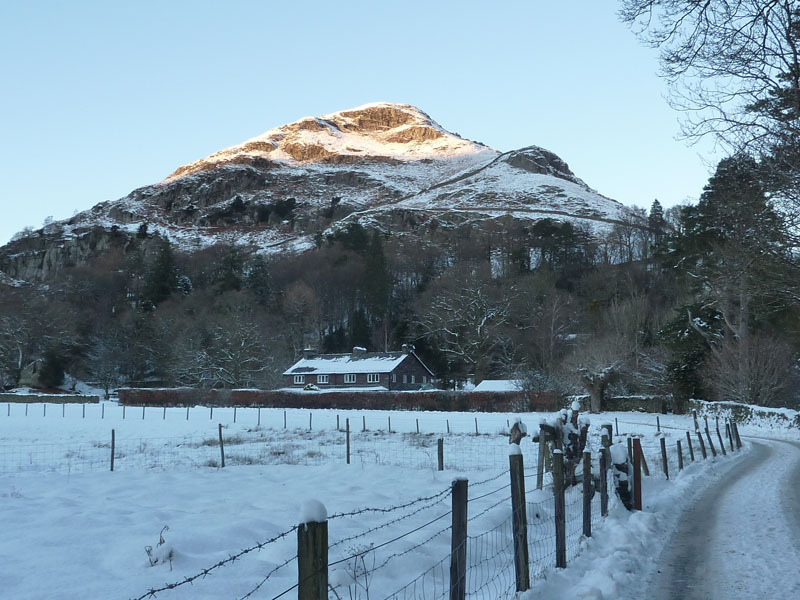 The footprints are clear, Grasmere Lake is frozen. 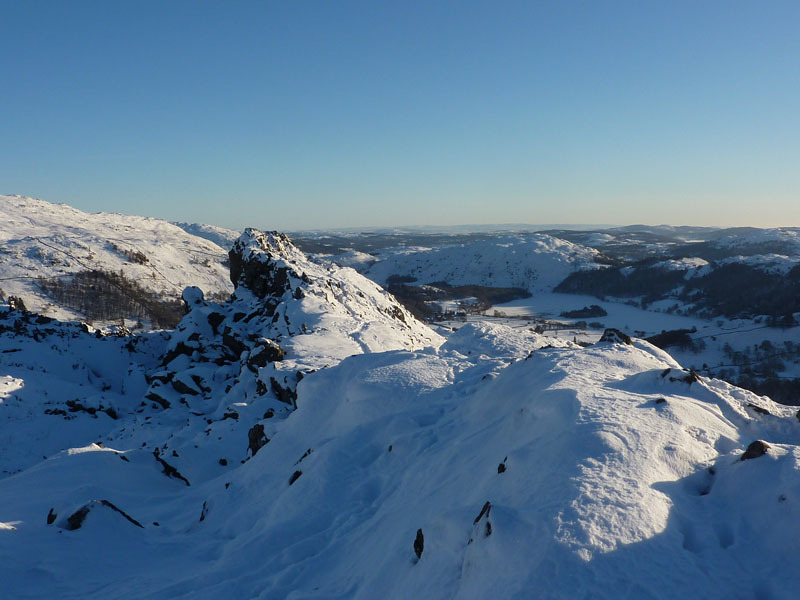 On the way down, I decided to use my crampons as parts of the steep path were frozen. Unfortunately, I tripped and went forward, whereas usually when slipping I go on my rear. 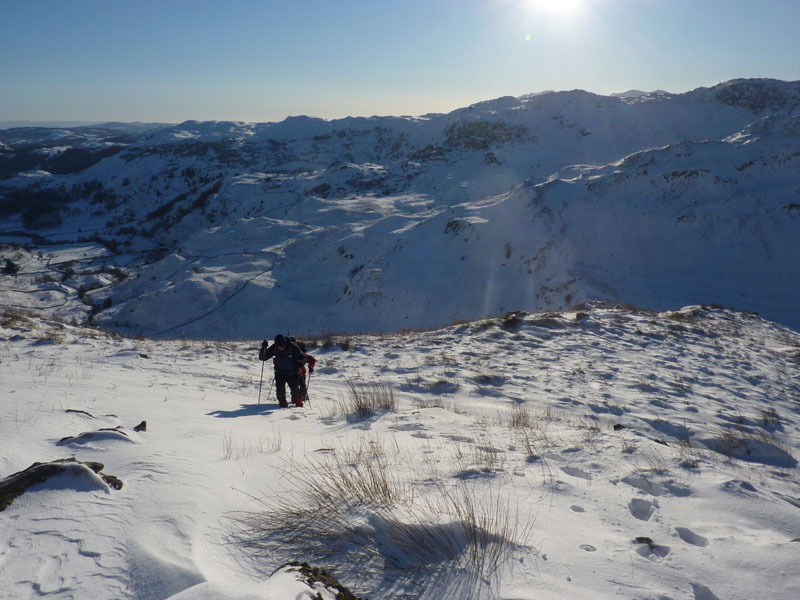 Contents of pockets flew out - camera, compass and mobile phone - all recovered and defrosted. Not pretty, dusted off, carried on - like you do. Luckily no one around. That was a challenging walk on a great day. 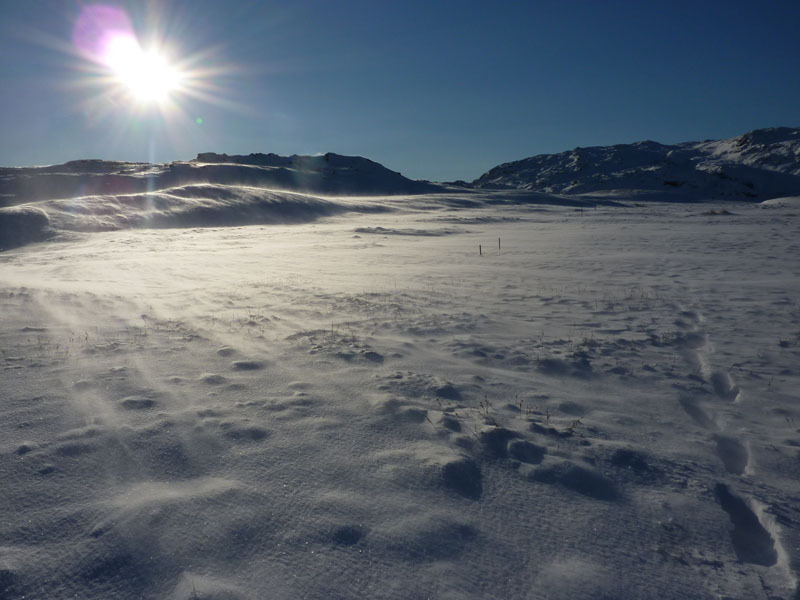 Don't underestimate the fatigue caused by miles and miles of deep snow. Ready for a brew before the drive home, I headed back to Grassmere. Time taken: 7hrs over a distance of approx. 8.5 miles. 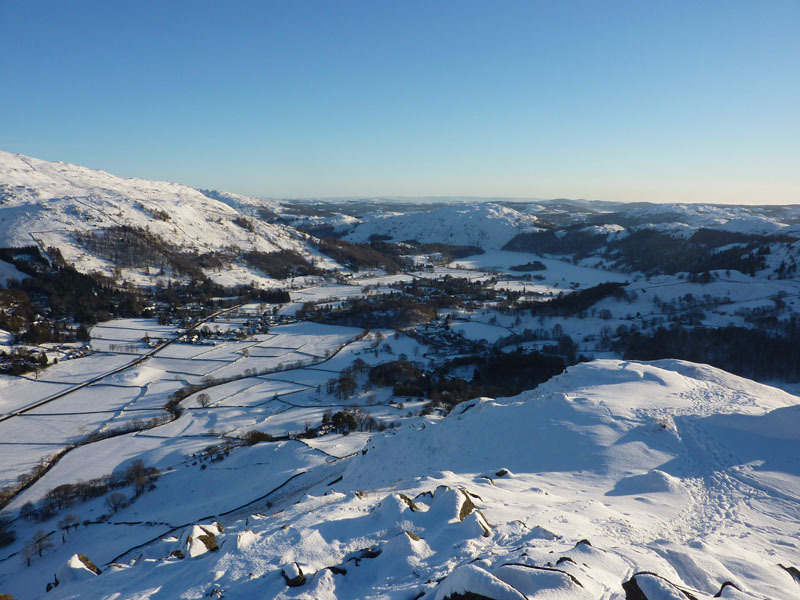 Route: Easedale Road, Helmside, Steel Fell, Calf Crag, Gibson Knott, Helm Crag, Lancrigg, Easedale Road, Grasmere. 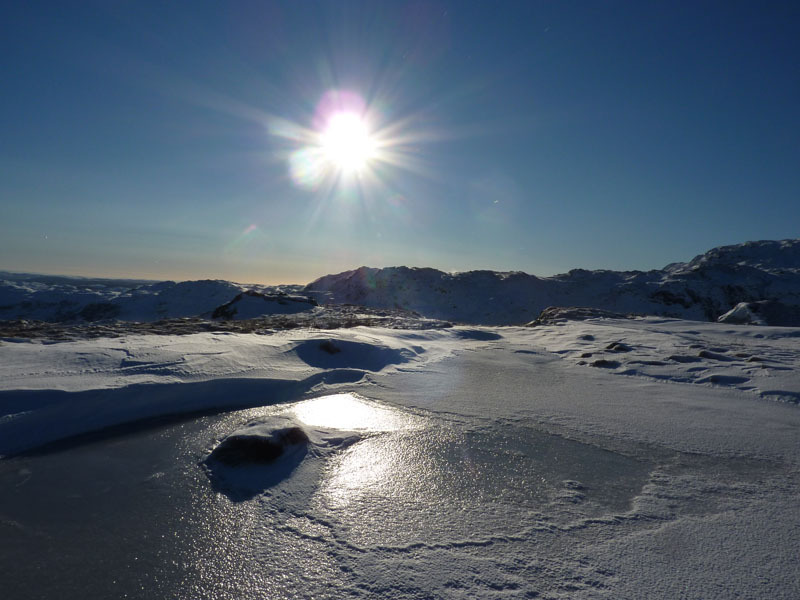 Weather and conditions: Sunny and cold. Northerly breeze from time to time. 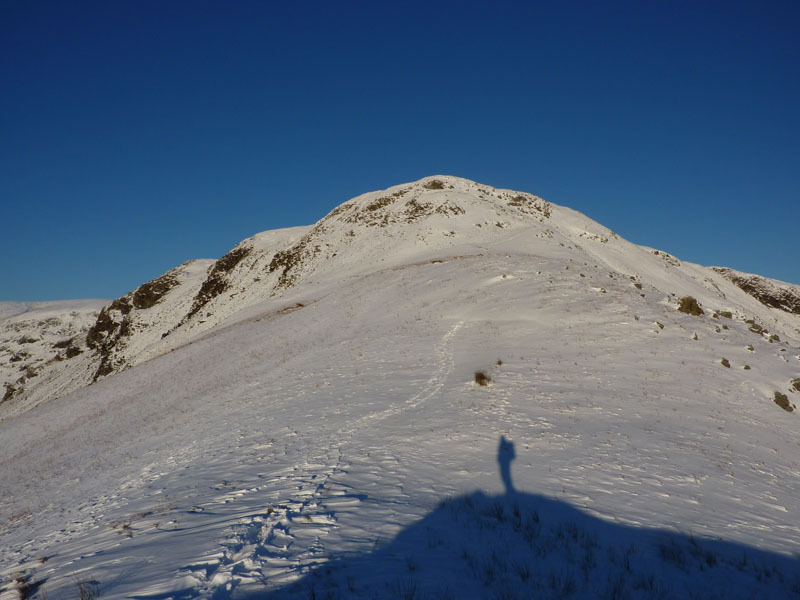 Greetings Count: First "Hello's" on Gibson Knott and then two more on Helm Crag - great to have so much space to myself on Steel Fell and Calf Crag. 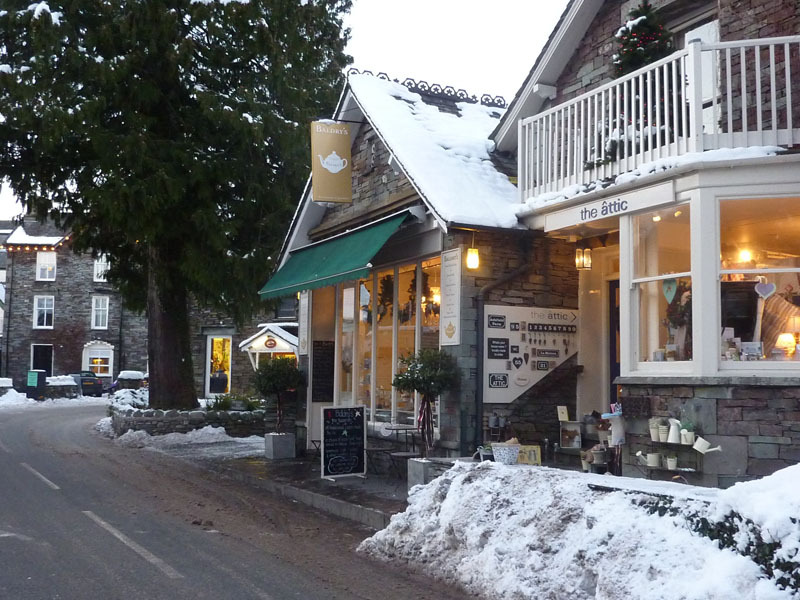 Richard's Refreshment Review: Tea & Tiffin at Baldry's in Grasmere. Relatively new ownership, great tea - tealeaf tea, extra water, china cups - what more would you want? Chunky Tiffin and a good menu for daytime snacks and light meals.